While both vacuum and solid-state electronics continue to evolve and provide unique solutions, emerging commercial and military applications that call for higher power and higher frequencies to accommodate massive volumes of transmitted data are the natural domain of vacuum electronics technology. 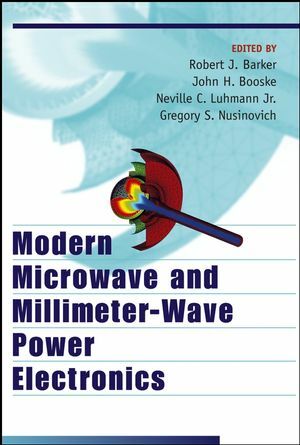 Modern Microwave and Millimeter-Wave Power Electronics provides systems designers, engineers, and researchers-especially those with primarily solid-state training-with a thoroughly up-to-date survey of the rich field of microwave vacuum electronic device (MVED) technology. This book familiarizes the R&D and academic communities with the capabilities and limitations of MVED and highlights the exciting scientific breakthroughs of the past decade that are dramatically increasing the compactness, efficiency, cost-effectiveness, and reliability of this entire class of devices. Concluding with an in-depth examination of emerging applications and future possibilities for MVEDs, Modern Microwave and Millimeter-Wave Power Electronics ensures that systems designers and engineers understand and utilize the significant potential of this mature, yet continually developing technology. SPECIAL NOTE: All of the editors' royalties realized from the sale of this book will fund the future research and publication activities of graduate students in the vacuum electronics field. ROBERT J. BARKER, PhD, is the program manager for ElectroEnergetic Physics at the U.S. Air Force Office of Scientific Research. A Fellow of both the IEEE and the U.S. Air Force Research Laboratory, he is coeditor of High-Power Microwave Sources and Technologies (Wiley-IEEE Press). JOHN H. BOOSKE, PhD, is a professor of Electrical and Computer Engineering at the University of Wisconsin at Madison. He has published over ninety peer-reviewed journal articles and has received the University of Wisconsin's prestigious Chancellor's Distinguished Teaching Award and the Vilas Associates Award for research excellence. NEVILLE C. LUHMANN Jr., PhD, is a professor in the departments of Applied Physics and Electrical and Computer Engineering at the University of California at Davis. He won the 1994 Robert L. Woods/DoD Award for Excellence in Vacuum Electronics. GREGORY S. NUSINOVICH, PhD, is a Fellow of the IEEE and a senior research scientist with the Institute for Research in Electronics and Applied Physics at the University of Maryland at College Park.